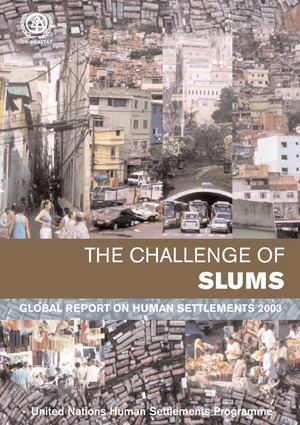 The Challenge of Slums presents the first global assessment of slums, emphasizing their problems and prospects. Using a newly formulated operational definition of slums, it presents estimates of the number of urban slum dwellers and examines the factors at all level, from local to global, that underlie the formation of slums as well as their social, spatial and economic characteristics and dynamics. It goes on to evaluate the principal policy responses to the slum challenge of the last few decades. From this assessment, the immensity of the challenges that slums pose is clear. Almost 1 billion people live in slums, the majority in the developing world where over 40 per cent of the urban population are slum dwellers. The number is growing and will continue to increase unless there is serious and concerted action by municipal authorities, governments, civil society and the international community. This report points the way forward and identifies the most promising approaches to achieving the United Nations Millennium Declaration targets for improving the lives of slum dwellers by scaling up participatory slum upgrading and poverty reduction programmes. The Global Report on Human Settlements is the most authoritative and up-to-date assessment of conditions and trends in the world's cities. Written in clear language and supported by informative graphics, case studies and extensive statistical data, it will be an essential tool and reference for researchers, academics, planners, public authorities and civil society organizations around the world.